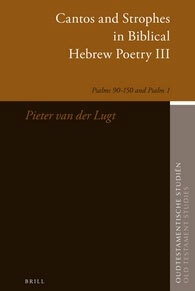 This volume deals with the rhetoric, the formal and thematic framework, of Psalms 90-150 (the Fourth and Fifth Book of the Psalter). It is the conclusion of the Psalms Project started with Psalms 1-41, OTS 53 (2006) , and continued with Psalms 42-89, OTS 57 (2010). Formal and thematic devices demonstrate that the psalms are composed of a consistent pattern of cantos (stanzas) and strophes. The formal devices especially include quantitative balance on the level of the cantos in terms of verselines, verbal repetitions, and (on the level of the strophes) transition markers. The quantitative approach to a psalm in terms of verselines, cola and/or words in most cases clearly discloses a focal message. This massive study is rounded off by an updated introduction to the canto design of biblical poetry (including the book of Job, Lamentations, the Songs of Songs, Deutero-Isaiah and other major poems of the Hebrew Bible).